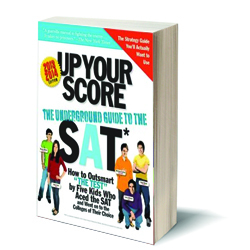 If you are a student who learns best with shortcuts, tricks and pneumonic devices, “Up Your Score: The Underground Guide to the SAT” will be exactly up your alley. This book was written by five people who all received perfect or near-perfect scores on their SATs. Larry Berger, Michael Colton, JaJa Liao, Manek Mistry and Paul Rossi go through the test section by section and teach you exactly what you need to know in order to ace the exam. Furthermore, this guide is a helpful resource for more than just your standardized testing needs. It is also a book that can aid you through some AP tests or could be a trusted source for your freshman year of college. Sure, it will not teach you everything you need to know for those situations, but it will be a refresher on vocabulary, math problems and effective writing strategies. “Up Your Score” is a worthy investment for SAT prep, and for simply getting a quick, concise review of what you learned throughout your high school years.